My son was diagnosed with CF when he was one month old (after failure to thrive). I took an additional two months off work but had to return to work when he was 3 months old. I had initially only planned to take three months off and weighed this return to work up against the new diagnosis, wondering if I was making the right decision leaving him with a carer at such a young age. My husband and I were working in our own business near home so thankfully I was able to continue expressing and checking on him throughout the day. 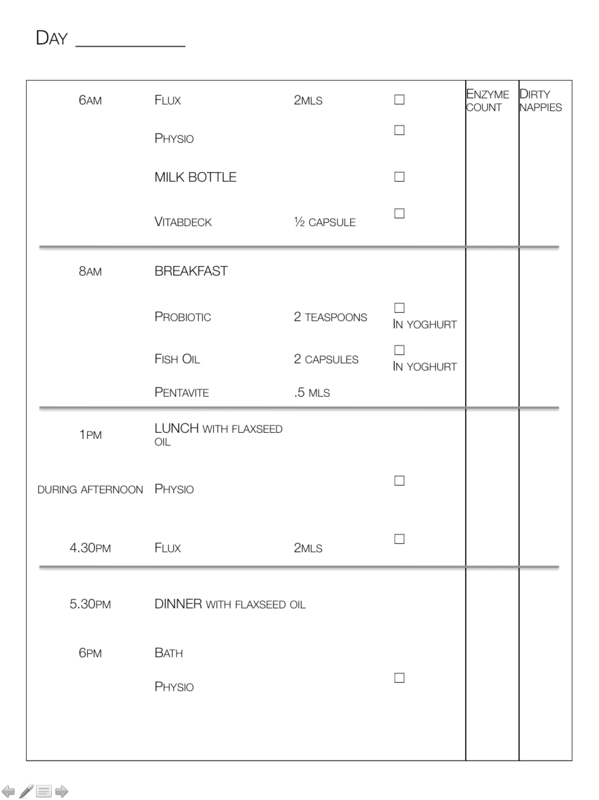 Whilst we took responsibility for all the medications and physio treatments, I did create very detailed routine charts, observation sheets and schedules for his carers at each age. It helped my husband and I (and the carer) to be consistent in our care and to communicate with eachother as to how we was going and how many calories he was ingesting. It was also important to us that we were giving him a wide variety of nutritionally dense food as we understood that he would need to be eating more deliberately than other children as he got older (getting the right kinds of calories not just additional fats to ensure adequate nutritional intake). I also had to travel a bit for work during the early years and our parents took turns coming up to Sydney to mind him. You’ll see in the routines that I also give notes on ‘what to do in a worst case scenario’. Thankfully this never happened while we were away but it was comforting to have a schedule (also for ourselves as much as others) so that we were clear on what should be done in the event that a cough developed. We thought of it a bit like an asthma plan . When it happens, especially when they are very small it can be quite stressful, so we found it useful ourselves to have a step by step guide to follow. Below are some of the schedules and routines I created which may be helpful for any newly diagnosed parents. We’re by no means experts this is just our experience which worked for us and may be a good starting point for new parents who are thinking about what CF might look like as their baby moves through some of the early stages. If you have any questions, please do feel free to leave your details here and I’ll get back to you but please do keep in mind that this is our experience only and may not be appropriate or relevant to everyone. * Please also note that I have taken my child’s name out of the routines and just replaced it with the term “Child” so apologies if it feels a little informal. * It’s worth noting in the newborn routine that I deliberately expressed (rather than breastfeeding) so that we could track how many mls he was ingesting as we had to watch his intake and resulting weight gain very carefully during the early months. Below is also the observational chart I used to keep in the kitchen where we would track enzyme counts for the day and also how many dirty nappies he had so we could monitor his output (so to speak!). The routines and outpout charts also helped us clarify what was going in and out so we could relay that to the doctors at clinic times. This meant that both my husband and I felt equally involved all the time, regardless of who was managing his care in any particular week. We also use to keep a list of fatty foods inside our pantry door (and the enzyme counts) so that we could bump up the fat in certain meals from time to time. We also have “fat stacking weeks” where all we focus on is super high fat foods all week long (interchanged with normal weeks as per the routines above). Below is the list we stick on the inside door (out of sight!) in our pantry.